My massage therapist says my neck muscles are so strained from being in this position they have ridges in them. Ridges? That cannot be good. Protocol dictates I come see her once a week for the next six weeks. I’m grateful for insurance (exclamation point) and I will definitely look forward to the relaxation time, but what about the in-between times? Without the soothing music and comfortable table and the healing touch of therapy? I’m left wondering–why am I so stressed? What is causing this perpetual stretching forward that ignites my muscles into overdrive? I think it’s the fretting. The worry about things I cannot control. There is much that could cause concern living in this fallen world. Supreme Court decisions declaring blatantly that wrong is right. National organizations standing by rulings that are anti-God. Turmoil in Egypt, acquittal verdicts that incite protests, the list goes on. righteous anger abounds and many people are torn to take sides. Closer to home, there is my own flesh warring against my spirit (and my spouse)and we’ve had 40 years of practice. We should know better. This stresses me out and makes me fret. Causes me to wonder if I’ll ever change. Is God really in charge? Really? The other morning I turned back to Psalm 37. King David declares 3 times in the first 8 verses “do not fret”. I looked up the definition of ‘fret’ in Merriam Webster’s online dictionary. The words brought a discomfiting and illuminating discovery. Evil is ‘live’ spelled backwards. Evil is me taking things into my own small, limited hands and thinking I have the power to do something about changing people. The only person or thing I have control over is me….and I can choose to yield that control to the all powerful God who is Sovereign and able to accomplish His purposes in this world in spite of me. Even when it looks impossible. I can choose to trust, delight, commit, dwell and rest. Choose to digest the truth instead. I can release my worrying, fretting, my anger to God’s capable hands for Him to do his will and his work. Until that final feast when we eat at the banqueting table with Him, I will choose to trust, delight, commit, dwell and rest. Amen. Let us relax and rest together, trusting that He is good and He is able. Elizabeth, when we first moved here I cried for 6 months….we left California where we'd lived for 18 years in the same community. The Pacific Northwest could not possibly be more different than where we came from, in every way. God gave me a verse from Isaiah before we left, with a picture of an axe cutting down a tree…..and said he was making all things new. But the cutting down still hurts. I'm so glad to be part of the 'new' with you. While I do not have pain issues that are causing me stress, I realize that I have a different kind of pain, if you will. The pain I am experiencing is literally change. While I like change a lot (because I am a bring it on kinda chick that likes being hit by a 2×4) I find myself in this season having difficulties with the mere word of change much less the idea of my entire life has changed in a vast year! I am in a new town. New people. New schools. New living arrangements. New husband. New step-child. New possibilities of a job. New churches. New, new, new. All of these things coupled with what God is showing me about myself in the inner most hidden places of Elizabeth? Sheesh.. But the thing is, I have a savior to cling too! While that seems easy to say, it is much harder to do. However, I take solace in that tiny little thread at the bottom of his cloak that I desperately hang on too when I simply cannot do anything else. As someone said it above, I am choosing to surrender unto him. I must do this as I find the peace he is willing to provide through all of the changes that are swirling around me. Bottom line? It is a choice and today I am choosing to bask in the changes and how positive they are, instead of how overwhelming they could be! Oh boy, do I relate to this!!! My chronic neck/back pain is definitely stress related. Nancy,you always have an 'add to' that amazes me–I like the idea of one word each day of the week and feasting on the weekends…brilliant! Marlece==let's trust God each day together, okay? Thank you for your honesty, Jody, and the wisdom of your strategy, to trust, delight, commit, dwell and rest. M-m-m. One word for each day of the work-week! I wonder what would happen if we focused on one of those words each day? We'd need one more for the weekend…maybe “feast.” Lord, take our desire to be totally submitted to you, and work it into reality. Oh Jody, I think I have 'ridges' in my shoulders/neck too! Warring against flesh and husband(a little smirk on that one) I am with you! As you said it is such a choice…..I will try harder and it looks like you are too, on the subject of lets just leave it all on Jesus' shoulders he can deal with it all in a much better way than we can. Yes, well……….I struggle with the same challenge–all that internet noise out there. I've had to be very purposeful about where and what I read around. And I'm getting better at taking Sabbaths from the internet–my own way of observing rest. It can only be good for us, eh? Mia, even with your health limitations your work and your words shine a wonderful light. I pray this would be a year of healing for you. Mary, it IS life long learning. It can be frustrating that we continue to trust, but I'm thankful for the Holy Spirit's nudging that keeps me pressing in. Just the question that drove me to the convent for a week. And I found out something very interesting. My feeling of being PUSHED…of being crowded…is directly proportional to the amount of time I spend on the internet. That, as it turned out, was not an easy, but a straightforward fix. I turn on my computer, do what I have to do, and shut it off so it doesn't call me away from what I am supposed to do. It helps. A lot. Amen for evil that is taking things in your own hands!! I think that is what Adam and Eve also did. I battle with fretting about my limitations with Fm/ CFS and I need lots of grace to overcome this. Great post, thanks. It's HARD when you see a situation that has brought stress about to repeat- I have to keep telling myself out loud- GOD HAS NEVER FAILED AND HE IS NOT ABOUT TO START FAILING YOU KNOW SO TRUST !!!! 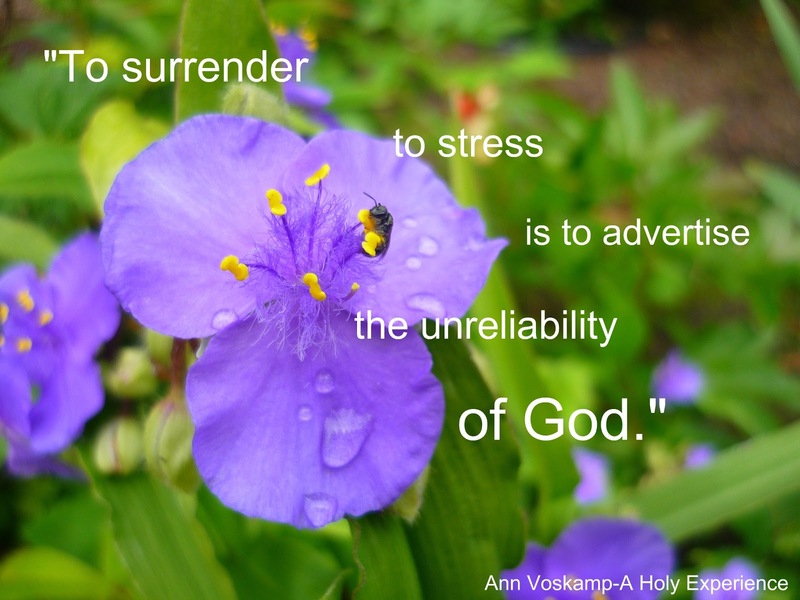 Ann Voskamp hits the nail right on the head. God Bless you in whatever you are facing, too.